OligoMaker is a fast cost-effective DNA & RNA synthesizer for oligonucleotides. The DNA & RNA Synthesizer (OligoMaker) can synthesize ex. 10 oligos (20-mer) in less than 2.5 hours. The NDA & RNA Synthesizer (OligoMaker) is very flexible and can easily be upgraded for the number of channels as well as the number of base positions. OligoMaker operates in a new and very simple manner. OligoMaker is designed for synthesis of primers and probes in 10, 50, 200 and 1.000 nmol scale. All oligos are synthesized in parallel, and the final product is ready for post synthesis treatment in a 96-well format. OligoMaker uses standard type ABI3900 columns. We deliver columns at attractive prices. In High Throughput scale the 192 columns are rearranged after the synthesis in two 8×12 rack (<5min) and a standard robot takes over in the purification step. 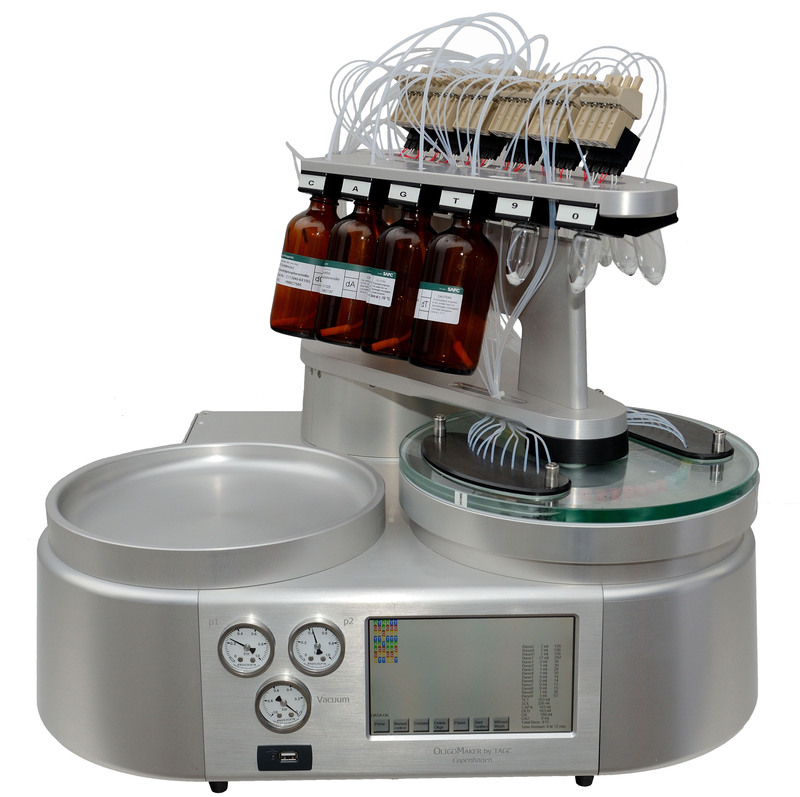 The OligoMaker has a compact design with the following specifications: 65x55x55 cm (LxDxH), weight 55 kg.